Sir Arthur Richard Jolly, an eminent development economist, is Honorary Professor and former Director of the Institute of Development Studies at the University of Sussex, UK. 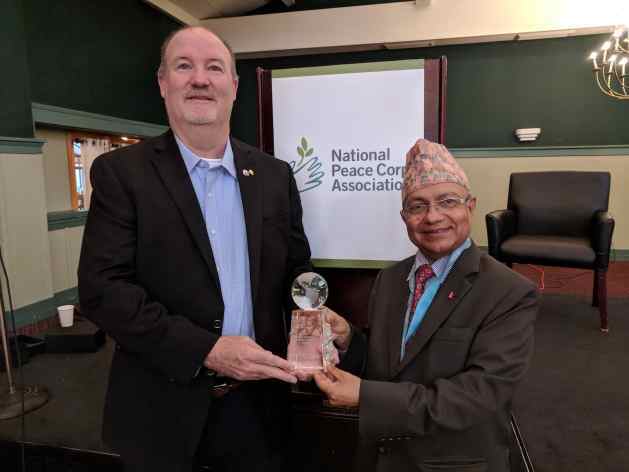 Former Deputy Executive Director of UNICEF and UN Assistant Secretary-General Kul Gautam accepts Harris Wofford Global Citizenship Award from National Peace Corps Association President Glenn Blumhorst on August 24 in the US. BRIGHTON, UK, Aug 28 2018 (IPS) - Kul Gautam’s memoir is everything which one hopes for from a good biography. There are difficulties all along the way, obstacles and challenges overcome and a vision pursued with extraordinary persistence in spite of everything. There are successes and triumphs, many of real significance. And there are lessons to be learned, albeit presented with self-deprecating gentleness and modesty. Kul Gautam’s story has all of this and much more, set in a journey from a poor village in one of the world’s poorest countries to operating at the highest level, negotiating with government leaders at World Summits of the United Nations. Collaborating with Kul in my role as Deputy Executive Director of UNICEF, from 1982-1995, was not only rewarding professionally, it cemented a friendship that has endured to the present. Kul’s early life and teenage years are eye-opening for those of us born in middle-class comfort in the richer parts of the world. Kul had to break free from the constraints of his Nepali village in order to train as a priest – which itself involved travelling miles away to India, the first five days on foot. There, seemingly established in Sanskrit and religious studies, his intellectual potential for more serious education was spotted and he left for secondary school back in Nepal. With good fortune, the teachers at his progressive public school helped him build an impressive academic record and he was offered a full scholarship at Dartmouth College in the United States. But when all now seemed straightforward, bureaucracy intervened and he had to spend nearly two further teenage years trying to persuade the authorities in Nepal to give him a passport and let him accept the scholarship. These efforts alone are a study in how to overcome the rules of well entrenched bureaucracy, requiring skill as well as extraordinary persistence. After graduation, Kul has had an extraordinary and fulfilling international career – in Latin America, Africa and Asia – working in UNICEF for children at various levels of leadership. Starting near the bottom, he ended up as an Assistant Secretary-General of the United Nations. Initially, Kul found himself in Cambodia, conflict ridden and with a government about to collapse, which it soon did, with Kul evacuated in a diplomatic plane full of embassy staff. But while in Cambodia, Kul’s youthful idealism and openness to new thinking never lost him, though perhaps one must add for better or worse. It was there, newly wed, that Kul remarked to his wife Binata, that “he would not mind being kidnapped by the Khmer Rouge”, as this would give him the chance to learn more about them and their thinking. Scarce wonder that Binata, living outside Nepal for the first time, was occasionally scared by her eccentric husband. Kul also shows how the most successful interventions for children – and development – are often achieved by seizing new opportunities, breaking new ground, rather than by cautious step by step progression along previously negotiated tracks. Those who know little of the practical operations of the UN will find Kul’s descriptions of UNICEF in action to be fascinating and revealing – in Indonesia, Laos, Haiti and afterwards overseeing UNICEF’s work in Latin America as a whole. Those with knowledge of UNICEF and other international agencies will be pleased to recognize the names of many colleagues they have known. Others will enjoy Kul’s insightful, often amusing stories of his encounters with celebrities and leaders of all stripes and foibles. Important lessons emerge from all these accounts, especially those showing how quiet diplomacy and empathy with the situation and culture of the nationals with whom UNICEF worked could often ease initial suspicions and find solutions even with difficult bureaucrats. Nor are they usually the result of individuals acting alone, but almost always as part of a group or team working together, often acting within an individual country but backed up by regional and international action and support. The pioneering features emerge most dramatically when Kul is based in UNICEF headquarters New York, where – like me – he worked hand in hand with Jim Grant, UNICEF’s visionary Executive Director and legendary leader. Many readers will be aware of the MDGs and the SDGs, the Millennium Development Goals and their current sequel, the Sustainable Development Goals, agreed at summit meetings in the United Nations in 2000 and 2015. Kul documents from first-hand involvement the little-known origins of these global goals, in the late 1980s when UNICEF organized the 1990 World Summit for Children, the first truly global summit ever convened on any topic, as Kul makes clear. Kul’s responsibilities included drafting the document setting out these goals for the 1990s and helping to gain their acceptance, itself a story with many twists and turns. The summit set the priorities for much action for children worldwide and especially for UNICEF over the 1990s which, in turn, laid the foundations for the broader goals of the new millennium. Kul was then made responsible for drafting the key documents for assessing progress made towards these children’s goals and for drafting and negotiating new goals linked to the MDGs. On all this, Kul provides detailed descriptions of the skilful efforts needed to bridge gaps and produce an agreed document. He lays bare a process often hidden from the public at large, even members of NGOs and others participating on the edges of such negotiations. Careful readers will not only understand better the often-tortuous interactions involved, but how Kul was able to preserve most if not quite all of Jim Grant’s original vision for children in the final set of commitments. Gaining global consensus around such an ambitious and far-ranging agenda for change was an unprecedented achievement. The most influential parts of Kul’s long and distinguished career have been of international service, working in UNICEF, but later in other organizations of the United Nations and in non-government organizations like RESULTS and OXFAM. Kul’s clear and vivid prose illuminates in fascinating detail what happened following his departure from UNICEF, often bringing out further lessons. This remarkable story of Kul Gautam’s journey from village to the heights of the international action for children and humanity is one of extraordinary success, achieved through talent, intelligence, hard work, persistence, comradeship and much help along the way. In the early years, support from family, friends and teachers made all the difference; in the later years, working in UNICEF with strong colleagues, great support and outstanding leadership brought out the best in him. It is a story of endless fascination and inspiration. Kul’s story continues to inspire on every page, with vision pursued, challenges faced and opportunities grasped, all with insight and skill to make positive improvements in the lives of children. It is a story told with quiet modesty and self-deprecation, traits that are all too rare in leaders and that I have always appreciated in Kul. If so much vision and energy can emerge in one person from one village in Nepal, it leaves one wondering what might be possible if the vison, talent and energy hidden in many other corners of the world could be released. From 1982-2000, Sir Richard Jolly was Assistant Secretary-General of the UN, serving first as Deputy Executive Director of UNICEF and later as Coordinator of UNDP’s Human Development Report. He was also co-director of the UN Intellectual History Project.